Yesterday's point was that permanent games must derive their fun value from challenging and honing "the skill". One time games can exploration based. Of course all games can be spice up with other sources of fun, but the main source must be honing a skill. We expect the players to play thousands of hours with their game and exploring won't last that long, other sources are simply beaten by competing non-games (like Facebook for social fun). Physical strength and endurace: these skills were obviously useful for our prehistoric ancestors and for a lesser extent to us too. The genes that rewarded challenging these skills obviously increased survival chance, therefore spread. Animal cubs, long before the humans played wrestling to prepare for the hunt that will get them food as adults. Playing games challenging strength and endurace are obviously fun, that's why the countless sports exist. Unfortunately computer games have little place here with the current hardware. Dexterity, reaction time, hand-eye coordination: the usefulness of these skills are also straightforward, and genes that rewarded these activities with fun spread. There are countless computer games with limited content that exist for decades and still considered fun, pac-man is the most ancient example. Starcraft, HL Counterstrike are much more "recent" games, but still decades old. Yet they show no sign of "burning out". Thinking: I wouldn't separate intelligence from knowledge here, since we use while thinking about a problem. The fun from figuring something out, the "Euréka!" feeling, is well known. Chess, majong, go and similar games with very limited content are played for centuries because they reward using and honing the thinking skill. Social skills: the ability to get information from others and get them to cooperate with you, help you (and don't harm you). Obviously useful and gives the good feeling of power. Don't mix it with being social, the fun coming from friendship. EVE online, which is mostly about politics, spying, manipulation and such is running constantly, despite the computer games limit the social skills greatly by allowing only text or voice at best. "Work ethic", "hamstering", "completionalism": I don't have a good name for this skill, but I'm completely sure it exists. The lack of it provides the lazy bum, and we all know the good feeling of "Well done!". The ancient hunter who went out hunting when he wasn't hungry had better chance of survival than the guy who started hunting when he was starving. The guy who felt fun from watching his pot filling up with beans had much better chances during winter than the guy who foraged just for today. We are descendants of hard working people and we inherited the genes that give the fun feeling when we see our stockpiles filling. The traditional MMO use this form of fun. "children skills": these skills are developed by children and every healthy adult has capped them. Hide and seek practices spatial awareness. Figuring out that Johnny can be behind a tree, but can't be behind a brick (as the brick is smaller than him) is a challenge for a small kid, but not for an adult. Obviously mainstream games can't aim on children skills. You can design a game to any of these. However you shall focus on one. On the one hand people have different priorities on the forms and any kind of mixture would now and then force people to do a different form of activity. This is the infamous "I won't play a bad game until max level just to have fun later" problem. The game that focus on one form of skill will always provide fun to the player who want to experience the fun of honing his skill. If he gets tired or want to focus on another skill, he will not play for some time. But he is never ever annoyed by the game. The game that mixes two skills will fail because it's too X for one player and too Y for another. You can never hear a chess player whining that chess is too "thinky". He want to play on a thinking game or he wouldn't play chess at all. The other problem with mixture is difficulty: the game must be just in the right difficulty for every player. If it's too easy, it's boring, if it's too hard, you learn nothing. You experience flow when the task is on your limits, but still doable. You might noticed that most long-living games are PvP. It's simply because in ladder PvP the difficulty is auto-adjusting. Every time you win, you get higher and face stronger opponents, every time you lose you get weaker opponents, you always oscillate around your limits. A PvE game with one flat difficulty is good for very few players. It's too hard or too easy for the vast majority. The solution is either multiple difficulty settings or gradually harder levels. In Tetris, which is a dexterity game (you have to recognize shapes in 3D and move fast accordingly), players are "stuck" on one level (someone on #5, other on #15) and have to practice on that level to improve. You can easily see that MMOs, where you play the same match for years can only work with the "hard working" skill. You gather more and more resources, progress. In a dexterity game there is nothing you carry over, besides the skill itself. Series of short matches serves that much better. Now let's analyze the glorious rise and then the shameful stagnation and fall of WoW. Vanilla WoW was a pure "hard working" game. Your progress depended on how much and how effectively you worked. There were action in the game, but due to the GCD and cast times, it demanded dexterity that vast majority of people easily had. Of course you had to understand the game, but for non-retards it wasn't a challenge. So you could concentrate on one form of skill: "hard working". People completely wrongfully assume that WoW beaten EverQuest because it was "less grindy" or because it had smaller death penalty. No. 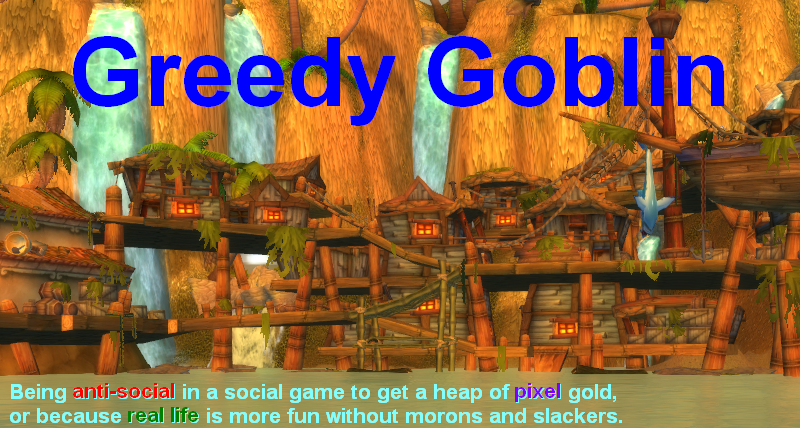 It won because EverQuest had forced grouping, making the game mixed "hard working"-"social skills". WoW was pure "hard working" until the endgame, where raid organization needed social skills which did not belong to the game. No wonder everyone referred it as "the organizational nightmare". To reach "more casual" players WoW allowed new players to "catch up", devaluing the previous work of the players. Remember "working" skill is not mindless slaving. It's about effective creation of value. If the most effective way to get an item is to not log in for 2 months and then get it for free, players will not log in. Casual players existed and were happy in Vanilla: they did the same as the hardcores, just on a lower level: gathered resources, progressed. They did not mind about their less progressed state more than the local team soccer player for not reaching World Championship. The gear resets took away the "hamstering fun" of the casual just as much as the HC. He was happy with and proud of his dungeon set and it was devalued too. To make it worse, to make raiding accessible, but avoid total faceroll, the dance was introduced, making the game a dexterity one. Most of the current raiders are dexterity skilled, and they openly hate the leveling (which is still "hard working"). Raiding should exists as the test and trophy provider for the game. The better "hard worker" got better gear, and was rewarded by bosskills and boss trophies. The good MMO raiding fits into the "hard working" scheme of MMOs: the performance both depend on the previous "hard work", and the raid itself needs accuracy, carefulness and concentration (but not intelligence or dexterity). I'm not sure we are supposed to compare "modern" (as in, future) MMORPGs to the classic ones like EQ, DAoC or M59. They may have the same genre-name, but they are vastly different in anything but that, courtesy of a completely different video gaming playerbase. I agree about WoW's failiures but I think that vanilla WoW would be dead or dying now too,assuming just content updates but not gameplay changes. The people who finally got their D1 before the end of Vanilla would still be playing working on their D8 in the latest "hard-working" expansion. The problem is there would be no-one working on the D1 set because the enormous cliff of hard-work before D8 would put off new players (of all kinds except masochists). They may get a few starters who then quit after working out the progression they have to go through to the latest content or just that the enormity of the task ahead would be too daunting. The real word analogy would be something like chess, which, unless you start playing early in life and keep at it, has such a steep cliff of learning after the basic "exploration" phase that very few adults take it up competitively. Blizzard had an inital solution to this and it was overlapping expansion gear (e.g. no need to get D1/D2 to survive in TBC) and easier content. They also started making raiding the only end game (Kara) instead of allowing 5-mans to feel like an end game. Unfortunately they probably went too far in WOTLK down this path and you can't go back without losing current subs. So they tried something else. I completely agree with your assesment in group content here gevlon. Players complained about the difficulty of cata dungeons at first, i found the mechanics that bosses use to be simple, and easy to counter. What ruined it for me was all the poison / aoe / unstoppable wipe mechanics everywhere if even someone messed up. I couldn't present any amount of skill on my side to prevent it from happening. It still excists. If you do not stack up in forcefield / bubble / whatever you die. No amount of healing i can do will stop that from happening. There was nothing in my previous skillset ( class knowledge & healing skill ) that helped me in the content. Rather then doing my thing, i running around like a mindless chicken, trying not to stand in fire, goo, run back to cauldron to kill mob, away from the chain, back on the chain. etc. It doesn't feel tactical but more of a frenzy, where i have minimal influence on the outcome of an encounter. I feel that my previous model no longer works, regardless of the amount of practice i get in 5 mans, i'll still be as ill equipped in healing raids as without it. in the end my influence is nearly 0. If i screw something up we wipe. But if someone else screws something up there is no responce i can present to prevent the wipe resulting from his action. My work is no longer rewarded in this current format. Very interesting post. But I have doubts about applying it to the WoW. On the market with hundreds of games which use the same principles can one be more successfull than WoW? If I produce another computer game is it really a new game or just another soccer field in the next city? Is there really so big market of "hard working" MMO fans? Perhaps facebook games are more interesting for "hard working" players. Web browser on the other hand cannot provide good dexterity games yet. Perhaps Blizz just changed the genre and we did not noticed it yet. Hamsterism == conscientiousness. The art of doing what you said you'd do and of not forgetting details. I don't necessarily agree with your latest posts simply because, Vanilla is seen as the "glory days" while WOTLK and Cataclysm are considered failures. In the eyes of Blizzard this isn't actually the case. The subscription count has steadily grown each expansion, with the highest numbers appearing during the Cataclysm launch. The 'fall' that we have seen in the last six months, also took place in WOTLK and was mentioned by Blizzard. This also happened in the Burning Crusade and Vanilla. Since we were never told official subscription numbers during those periods most people assume the subscribers stayed constant or growing throughout the expansions. In the MMO industry the subscriber count isn't a constant up or down movement. It moves in cycles, there is a large influx of players during an expansion release, followed by a slow descend over the next couple years. As long as the influx during release is larger then the decline during the expansion the game is growing. I believe your post shows why this decline occurs but not neccessarily that Vanilla or Burning Crusade were anymore compelling long term for players then the more recent expansions. In regard to the explanations of why certain games are compelling long term. I believe another major reason for this is that they are always attracting new players. Since most successful games/sports are fairly simple to pick up (atleast at the beginner level) new people are constantly trying them out. This constant influx of new players, causes the constant loss of players to be unnoticed and unsignificant. This is a major problem for a game like WoW. Each expansion the developers are adding new content and new leveling experiences that makes picking the game up very daunting to a new player. So, the inevitable loss of players that happens in every game in life, can not as easily be matched by the gain of players. The "shameful stagnation and fall of WoW" has nothing to do with undermining the hardworking element, which is alive and well even now; it has everything to do with the natural reduction in the novelty of the experience. The guy having fun "watching his pot filling up with beans" will NOT have fun filling up an infinitely large pot. There has to be an end-point - the reward of a survived winter - in order for the fun of collecting beans to be realized. Those beans also meant he could relax in his tent instead of scrounging around in the snow. The guy would have less fun filling up a pot with beans as a slave, even if the survival benefit of a full pot is the same. Why? For this guy knows that, as a slave, his task is never-ending. As Morhaime has commented, the WoW market is saturated: there are more ex-WoW players than WoW players. The people who enjoy hardworking in games have picked up WoW, enjoyed it for many winters, and are now moving on to pick beans in new fields. It has nothing to do with anything WoW has or hasn't done. Frequent gear resets, at most, act as more frequent winters. After so many winters in one place, it is time to move on regardless of whatever other claims of quality the game has. The novelty of gathering beans fade, and slave-like, rote gathering sets in. In any case, a WoW that was simply building on vanilla for the last seven years would still experience a "shameful stagnation and fall." Unlike sports/chess/etc, which have the benefits of tens of thousands of years of iteration, there will always be better, more novel iterations of videogames on the horizon.